The opening verses/chapters of Genesis are almost guaranteed to excite debate. Whether it is science v. creationism, or poetry v. history, interpreting the opening part of Genesis seems to cause splits between Christians and atheists, and Christians and other Christians. Creationism (and its associated ‘young earth’ and ‘seven literal days’ doctrines) has hit the headlines for all the wrong reasons (actually, maybe for all the right reasons) in recent weeks here in Scotland. A Christian group, working in primary school chaplaincy, were handing out creationist literature to the pupils, even the very youngest. Chaplaincy is a privileged position in schools. Chaplains are allowed in only at the invitation of the Head Teacher. It is clearly understood that proselytising is not acceptable, although that is not to say that we cannot share an understanding of our Christian faith. Handing out faith tracts which represent a fairly marginal position to children who do not have the critical faculties to assess it is, I would suggest, an abuse of that privilege. I have been doing some cramming for tomorrow’s exams and one of my topics was Barth’s take on Providence. I came across a comment about creation and it brought to mind a previous discussion on the goodness or fallen-ness of creation. Barth was making the point that creation was good enough – good enough to allow God’s grace to work and good enough to enable the lordship of Jesus Christ. I liked that because it stood in contrast to some earlier reading on Augustine who was convinced of humanity’s utter depravity. Both allow for God’s grace. In fact, for Augustine, it’s an absolute necessity otherwise there is no hope whatsoever for humanity. We are, without God’s aid, utterly incapable of choosing Him. Barth doesn’t diminish the need for God’s grace but there’s an overall more hopeful image from him. Perhaps that reflects his universalist leanings. I confess I don’t know enough about the rest of his theology. But I liked the idea that creation is allowed to be messy and untidy and imperfect, just as we are as individuals. And yet, despite this, there’s room for God to work. In fact, one might argue that without it, there’s no need for God. But the other interesting thing about Barth is that God’s work of grace in this messiness is to turn us to Him and, in His creation, reflect something of His glory. I don’t get that sense of ‘improvement’ with Augustine. Ultimately all we end up doing in his scheme of things is avoid slipping back into the mire. With Barth there’s the sense of liberation not oppression. And there’s the true sense of Christian hope – that creation is being saved as part of God’s covenant promise as we see its outworkings in God’s providence. The world isn’t perfect, but it doesn’t have to be. Just as well really. Barring exams on the 11th and 19th, three of my four courses for 4th year are now done. Only one course and a dissertation to do and that’ll be 4th year and my BD done. It all seems to have gone by in a rush somehow, although I’m still convinced term-time ‘time’ runs at a different rate to real time. Of the three courses this semester, Hebrew Prophecy with Professor Barstad has definitely been the most enjoyable, not least because of some interesting class dynamics which I’ll not go into here. The bizarre thing is that, despite 10 weeks of lectures, I’ve barely got a handful of notes. This is mainly because most of the lecture is spent actually doing exegesis rather than talking about how to do it. It was a bit like being back in school – read round the class first, then ask questions. There’s always one particular ‘nugget of gold’ in his classes and the ‘light coming on’ moment for me was when he dropped in an almost ‘throwaway’ comment about “underlying reality” when considering the prophets. First and foremost, when tackling the text, the question to ask is, “What’s the underlying reality?” And it’ll be something like war, famine, idolatry, whatever. That then is the key to unlocking the language being used. From there it’s a matter of unpicking the metaphors. The problem is that it is also a slightly circular activity – unpicking the metaphors also helps to expose the underlying reality. I’ve already grumped about Biblical Interpretation several times but I sort of enjoyed the course but ultimately found it very dissatisfying. Way too much emphasis on historical-critical methods. The irritating thing was that almost every article we read concluded that historical-criticism only took you so far, yet we barey touched on the bits that might take you further. Even more irritating was that they were treated in an almost disdainful way, simply because they weren’t historical-criticism. I knew beforehand that the NT lecturers at New College are pretty much wedded to historical-critical methods and that it can do no wrong, but I can’t help but think that, for a research establishment whose academic approaches ought to be pretty much up-to-date, Biblical Interpretation was done a bit of a disservice. That said, to cover some of these other methods are a course in themselves – and I’m very glad I did it last year. Doctrine of Creation was interesting but pretty heavy going, as most systematics courses tend to be. Not sure that it contributed as much to my dissertation background as I had hoped it might. Still, once I get into that I’ll probably find stuff that is useful. Anyway, revision time now and I suspect that that time will disappear even more quickly and the exams will arrive all too soon. Maybe the headline editor wasn’t quite awake when they wrote this BBC News headline and summary, but I can’t help but think how awful it reads. 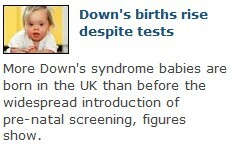 There’s an implicit sense of shock that anyone would continue with the pregnancy of a Down’s syndrome baby. To be fair the article is much more positive and I suspect that the headline may well change. Nevertheless, it still shows, I think, an underlying problem of attitudes towards anything or anyone who might be considered ‘less than perfect’ by some arbitrary personal or societal standard. Unfortunately the church isn’t immune from this. I still hear, all too often, about how bad and horrible and corrupt this world is. That, in my opinion, sends out the entirely wrong message. It implies (or even overtly states) that this world is worthless and shouldn’t be bothered with. There is the implicit “but we’re alright; we’re going to heaven”. Gnosticism is alive and well in the church today it would seem and will only reinforce attitudes such as the one found in the headline writer of that article. Creation may well be far from ‘perfect’ but it is not worthless. Regardless of how you would read the Genesis creation narratives, there is no escaping God’s pronouncement that creation was ‘very good’. So, rather than be in a rush to get away from it then maybe we need to look for the worth in it. To see the value that God saw in it. To love it through God’s perspective and not our own. Maybe then the life of a vulnerable baby will be respected and there will be joy that more babies are being born rather than an implied regret that they are. Genesis 1:31a And God saw everything that he had made, and behold, it was very good. Despite the early scriptural affirmation of the goodness of creation, Greek philosophical dualism, where heaven=good and earth=bad, still pervades much Christian thought. Heaven is to be ‘sought after’ and all that matters in the Christian life is that, one day, we will be in heaven with God. Heaven becomes the ‘be all and end all’ of faith, turning attention away from the needs of this world and its inhabitants. Yet this theological perspective, with its unfortunate implications for Christian ethics, does not enjoy incontestable scriptural backing. Rather than leaving this ‘bad’ earth behind, the apostle Paul speaks of the redemption of creation, freeing it from decay (Romans 8:20-21). NT Wright argues that Paul has ‘reimagined’ Jewish Messiahship and salvation in the context of an inaugurated eschatology, encompassing the entirety of creation. It is not, nor has it ever been, God’s ‘plan’ to wipe away this ‘bad’ earth and start afresh. Driven by the scriptural emphasis of redeemed creation and an inaugurated eschatology, our theology and ethics must encompass a better sense of what the ‘new heavens and the new earth’ mean for the ‘here and now’ and not just for some indeterminate future. Picking up on Wright’s insistence on a ‘reimagined salvation’ encompassing all creation, this dissertation will explore the theological ground of what eschatology means for creation itself. My supervisor is looking likely to be Professor David Fergusson and he reckons it’s “a worthwhile dissertation topic”. I’m currently trying to put together a possible bibliography, but the names Wright, Moltmann and Polkinghorne seem to crop up with regularity when searching for suitable sources, so I guess they’ll feature somewhere.